Volvo Penta Marine Leisure is launching a New Warranty 2 + 3 year. From week 23, 2013, the Volvo Penta warranty for leisure engines and transmissions will be increased to comprise up to 2 + 3 years. During the first two years of usage or max running hours, the new Volvo Penta International Limited Warranty offers repair or replacement of defective parts on the whole product. The warranty has a 2 year time limit or an operation-hour limit, whichever occurs first, for the engines and transmissions. Major Components receive additional protection, with up to 3 year warranty, which takes effect as the initial warranty period has expired. This provides the boat owners with additional protection. Definitions of major components for engines and IPS, see warranty manual. In addition to our normal warranty, you can now sign up for our Extended Coverage program and get an extra three years full coverage of the complete package – from helm station, engines, drives, to the propellers. By this you will stay ahead of possible, future repair costs. Add Volvo Penta ́s global dealer network - available in more than 130 countries - and you have everything you need for the perfect boat cruise. The Extended Coverage program gives you the same full coverage as the two first years of warranty. It covers repair and replacement of defective parts. This includes all Volvo Penta branded products, excluding consumables such as filters, hoses and belts. 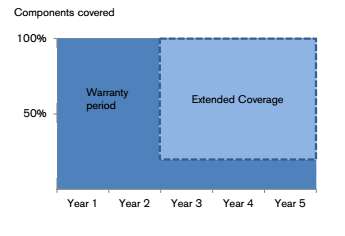 The Extended Coverage program is purchased when the propulsion package is ordered or within three months from the date of warranty registration. 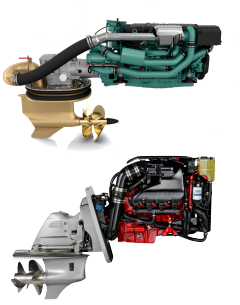 Available world-wide for all Volvo Penta branded marine leisure products, both diesel and gasoline. Please see table below for warranty and Extended Coverage duration for each engine.